Sometimes everything comes together — a great barrel, the right load, good bullets, and, of course, a gifted trigger-puller. Check out this target from Forum member Mike Ezell. That’s five (5) shots at 100 yards from Mike’s 30 Major benchrest rifle. When this group was shot a while back, Mike reported: “I fired a few groups in the great weather. No surprises — it did VERY well! My little wildcat, the 30 Major, has always been a shooter. That target was not a fluke — I shot a few groups today and Agg’d a high One.” Mike is a Kentucky gunsmith who builds his own rifles. What’s a “30 Major” you ask? This is Mike’s own wildcat, a 6.5 Grendel necked up to .30 caliber. Mike writes: “The 30 Major is essentially a .070″-long 30 PPC. With the great 6.5 Grendel brass available from Lapua, all you need to do is neck-up and turn the necks to prep the brass.” Mike says it is very much like a 30 BR, but you just start with 6.5 Grendel brass instead of 6mmBR brass. Share the post "The Amazing 30 Major — 6.5 Grendel Necked Up to .30 Caliber"
Perhaps the rifle and the build steps, along with load development could be featured in an upcoming “Gun of the Week” feature. It would beneficial to have a cartridge illustration as well. The 6.5 Grendel is a 7.62×39 necked down to .264 and the “30 Major” is a 6.5 necked up to 30 caliber… Did I miss something? 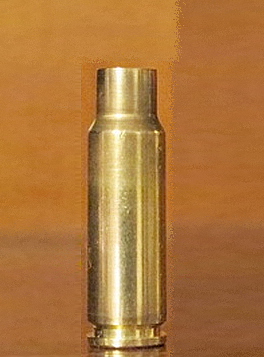 Why not neck up a decent piece of 7.62×39 brass to true 30-caliber dimensions instead? Nice shooting. I shot a group like that once with 6BR on a Savage action with Criterion barrel. Feels good. Wish I could keep doing it. How does this differ from the 30 ARX? Grendel is a distant relative, and closer related to the PPCs. The big difference between a 22/6/6.5 PPC/Grendel/ARX/Major and an x39 is the case body taper. That’s a big difference for magazine and platform compatibility with the AR-15. 6mmAR.com has made a 30 ARX what are the cartridge differences?